When the elite faction known as the 4 Horsemen formed in 1986…nobody could fathom just how influential the group would be. 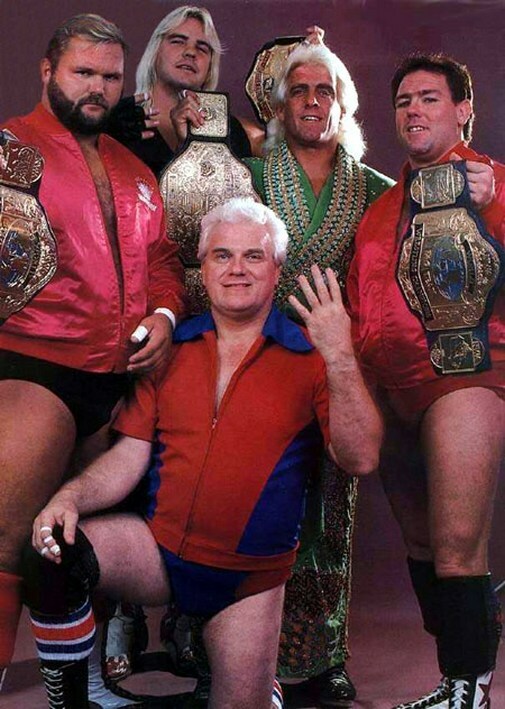 When you think about the truly great Horsemen, we immediately think of the names Ric Flair, Tully Blanchard, Arn and Ole Anderson and Barry Windham. Along with James J. Dillon as their manager…the Four Horsemen dominated the competition in the National Wrestling Alliance. What made them so great and successful? They not only talked about the jet setting lifestyle…they lived the gimmick. They flew in private jets, limousines, women in every city, fine tailored suits etc. They also were legitimately an elite group. While other factions had high turnover rates, the Horsemen stayed close knit and joining their group meant something. With that said, when bookers and “creative people” got involved with choosing new members….they quality of choices watered down the significance of what the Horsemen were all about. 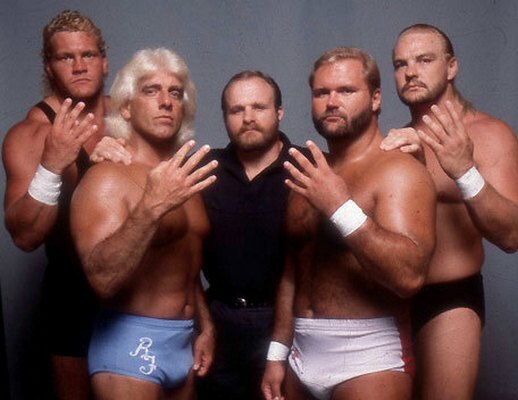 In absolutely no particular order, are the less successful Horsemen…the men who had no business holding up the four fingers. The men who did not live up to the ‘symbol of excellence’ as fans had grown accustomed to. Let’s first address the 800 pound gorilla in the room…we all know Paul Roma had no business as a member of the 4 Horsemen. He spent a large majority of his career in the WWE as enhancement talent. When he would be pushed on occasion, he was mostly used in tag teams. When he arrived in WCW, he still had that stigma surrounding him. Paul Roma was not the right Paul selected for the group….Mr. Wonderful Paul Ordorff would have been a much more satisfactory choice. There was even rumors to that Orndorff was asked, but turned them down. There was a point in time where Sid Vicious was the golden boy of the NWA/WCW. It only made sense that to further Sid’s career, he be aligned with the elite of the company. Unfortunately, egos and alcohol don’t mix and it caused a legitimate fight between Sid and the Horsemen ‘Enforcer’ Arn Anderson. The fight could have easily ended the life of “Double A,” as he received over 20 stab wounds to the chest and stomach with a scissor that Sid used in the fight. Sid would be released from the promotion soon after. Jeff Jarrett was just one of those pro wrestlers that always found himself falling into a good situations. Whether it was wrestling for his father’s Memphis promotion or befriending head writers like Vince Russo…Jarrett always found a way to get a significant push. When Jeff joined WCW in 1996, he found himself in another prime situation…a top “free agent” between the nWo and the 4 Horsemen. Jarrett chose the Horsemen, but the fans didn’t choose HIM. It became clear that the fans didn’t think he was Horsemen material and as quickly as he joined the Horsemen…he was kicked out or left…just as quick. A really unmemorable run for Double J as a member. If there was one choice worse than Paul Roma…it would have to be former NFL player turned announcer turned wrestler Steve ‘Mongo’ McMichael. The Four Horsemen had always prided themselves on being technicians in the ring and Mongo was not only not a technician….but lacked the personality that fit with the group. It was obvious that this was solely an Eric Bischoff decision to bring in mainstream media to talk about the WCW product. Much like when he brought in other celebrities like Karl Malone, Dennis Rodman and Kevin Greene. The year was 1989 and the decision was made to turn the heel Horsemen into babyfaces. To solidify that endeavor, the Horsemen added perhaps the most popular wrestler in the company…the man called Sting. The partnership was short lived as fans didn’t see the marriage of Sting and the Four Horsemen as making much sense. They just didn’t fit well together and in no time, the group turned on the Stinger rekindling that long standing feud. 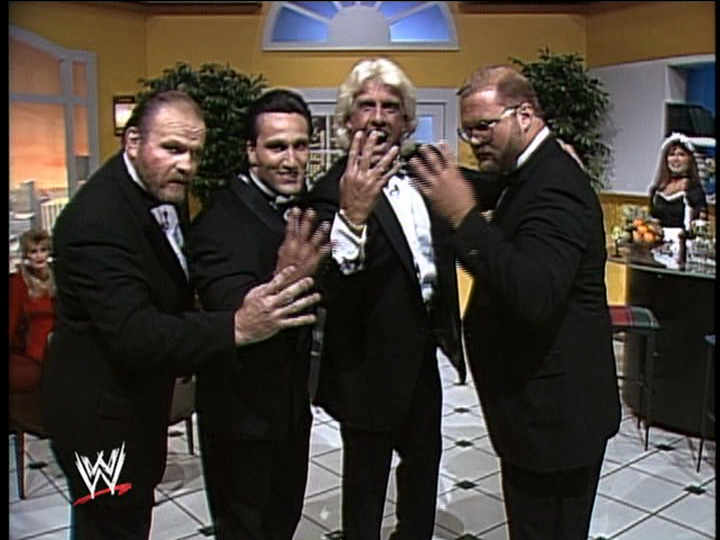 Sting joining the 4 Horsemen made as much sense as Dusty Rhodes in Polka Dots….oh wait. This final entry isn’t about one single individual that didn’t fit the Four Horsemen mold…it is more about an angle that didn’t fit their mold. The Alliance to End Hulk-A-Mania was a partnership between the 4 Horsemen and the cartoonish heel group known as The Dungeon of Doom. Why is this angle on the list? The Horsemen were suppose to be an elite group. They worked together as one unit. For them to be used in an alliance with such a silly group as the Dungeon of Doom, went against everything the Horsemen were about. Especially, considering it was one man that they were opposing. This entry was posted in NWA, The Four Horsemen, WCW and tagged 4 Horsemen, Arn Anderson, Bad Horsemen, Barry Windham, Curt Hennig, Diamonds Are Forever and So Are The Four Horsemen, Dungeon of Doom, James J Dillon, Jeff Jarrett, JJ Dillon, Lex Luger, National Wrestling Alliance, NWA, Ole Anderson, Paul Roma, Poor choices for Four Horsemen, Ric Flair, Sid Vicious, Sid Vicious Arn Anderson, Steve 'Mongo' McMichael, Sting Four Horsemen, Sting Joins The Four Horsemen, The Alliance to End Hulkamania, The Four Hoursemen, WCW, World Championship Wrestling. Bookmark the permalink. Fifi would have made a better Horseman than Roma or Mongo. I agree. Fifi had more personality than Roma and Mongo combined. It should have been only the original trio. The only ones i would have booked to be in the Horsemen are Dean Malenko and Benoit and that’s it. Oh wait forget Benoit! I would just have just Malenko and the originals and that’s about it. Roma himself once said in a TV interview that he had no business being in the Horsemen and that he was flabbergasted when Bischoff put him in there. McMichael was an absolute joke, and I agree that even Fifi would have been a better choice than he was. Malenko was a great choice, as I thought Benoit was. Hard to really consider that now after what we all know about Benoit. Orndorff would have been great in there. Thought Curt Hennig was an awesome choice, then WCW had to go louse that up by putting him into the NWO, where he was largely a non entity. Sting was an odd choice. When it occured, I knew this wasn’t gonna last any longer than a hot minute. Jarrett wasn’t as bad as it sounded, but he certainly wasn’t Horseman material (or NWO or Bullet Club, but I digress). The Horseman were the originals dat grabbed my attention while grownin’ up n da 80’s. I was new 2 da it’s existence n only knew da WWF; when 1 Sunday Morning I was flippin’ threw da channels n caught a few min.s of the NWA, these characters r announced by Teddy Shavonia; n they come on all w/ belts n hand n give dis egregious n stellar interview w/ JJ Dillion n of course headed by Flair. F/ derre on out I stayed n tuned n dis all aroun’ da tyme Koloff was a horseman after the whole Magnum fall out. The Horseman 4 a short tyme had an assembly of the original horseman( I think Ole was freshly retired) dats y they got Lugar n his dominating “Torcher Rack”. Then Nikkita. Dat was da Horseman at they’re very best. If Dusty n dem weren’t “real” they would have run da competition out of the gym. 4 me dats wat put my heart 4 wrestling n me; never 2 vacate it. Steve Austin was also a Horseman once w/ long blonde hair…Stunning Steve, I never 4get. But after all da yrs of Horseman’s exclusive dynasty slash club. I will miss dem 4ever. I will always “B” a Horseman: TRU n Threw. N I Thank dem 4 derre showcasing. They really set da tone 4 da standard. WOOOO….Hah…hah. It was da early 80’s when I first encountered a zesty n substantially well class of affiliates known as da 4 Horseman. They were introduced 2 me by Tony Shavonia n were decked out w/ titles n all. When da Head gave a vitiating n immaculate interview in which seemed was directed 4 me. It was aroun’ da tyme Ole had left 4 retirement n Lex Lugar n his (then) tenacious “Torcher Rack” joined da group but here’s da kicker aroun’ da same tyme Nikkita was linked w/ dem 2. O WOW!! Now dat I thank GOD 4; because watching dis sitcom comedy now: meaning wrestling, I don’t think I would have little 2 no respect 4 da sport. Not even YouTube would persuade me. I thank dese guys 4 all da yrs of entertainment. The Horseman were not good or bad: something dat always stood out 2 me. They set da tone n standard 4 da ‘sports’ foundation n fan base. I will always “B” a Horseman never 2 deface us. Even if it gets physical. Thx 2 “dis Man rite here, dis Man rite here, n etc”. WOOOOO…. Even Austin was once a Horseman. Hence: “Stone Cold Stunner”!!! Sorry guys! I didn’t kno da 1st 1 posted. Always love.